The creator of this presentation used Gallery theme and used it well by showing chosen pictures of Michael Jackson through his long career. it mainly shows the physical face changing he pass through the years. every picture has beside a short description related the specific physical face changing and the items he wore. This is a very impressive presentation that includes HD beautiful pictures and animation. you will see there nice and short biography on Michael Jackson – The Jackson 5, albums, hit song, album and of course, Billie Jean. Angelina Jolie has become the most popular actor in Hollywood, but do you really know her? In this presentation, you’ll see a detailed biography of Angelina Jolie in a newspaper theme – early life, pictures of her early stages, early teen years, becoming famous, her contribution to the community, her past, quotes, videos of her, interviews and bibliography. how much celebrities influence their fans ? well, it’s very interesting question. the following presentation cover very well this subject and bring up very shocking information about it. in this presentation, you will see – How do celebrities influence their fans on social media and on fashion, definitions of fan and celebrities, Celebrity Culture Then and now, research, benefits of celebrities influences and negative influences to fans. The following beautiful presentation is all about the most shiny event of the year – The Oscar. in this presentation you will see- what is oscar awards, the purpose of the Oscar, the date of it, the first academy awards ceremony, pre-party, the dress code for the academy awards, location, members and invitations, the hosts, the way of sitting, rules, categories, winners, tips for the winners, after party, dining etiquette, sponsorship and of course, 2016 Oscar awards. 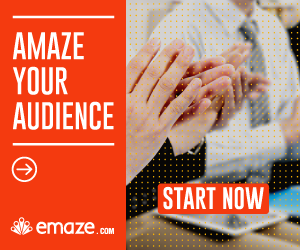 For more information about Emaze, read our Emaze review and start making amazing presentations !